Killing Kittens requires a cast of three. (2M) (1F) Click the icon for the character breakdown. 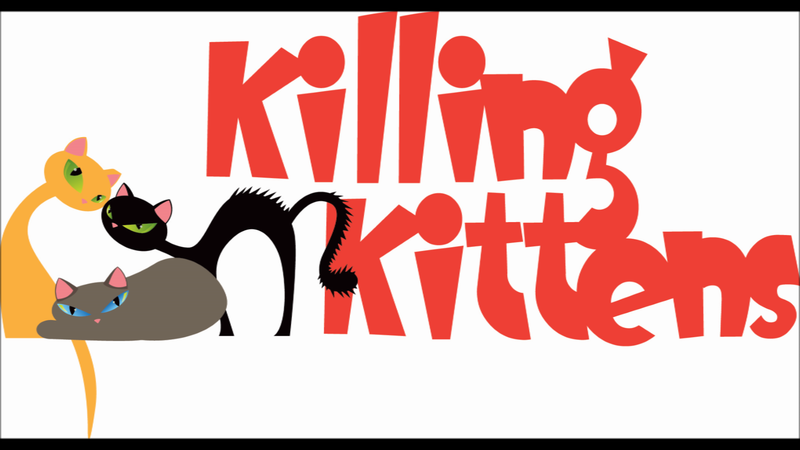 Click the icon to download free sample pages from Killing Kittens.. If you have questions or would like licensing information for Killing Kittens, please click the icon to contact me. Killing Kittens takes place on a single, unit set. Click the icon for additional information. 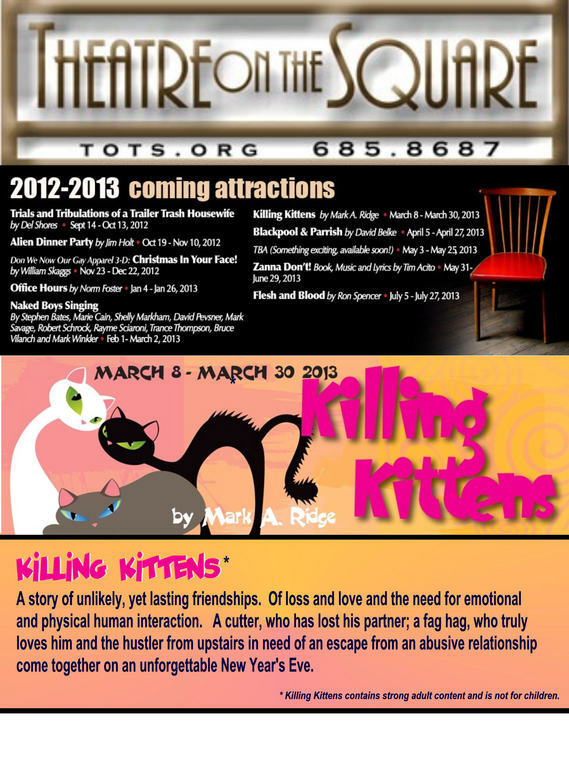 For a list of productions and/or staged readings of Killing Kittens, please click the icon. Please click the icon to see logo, advertising, publicity or videos for Killing Kittens. Killing Kittens is a story of unlikely, yet lasting friendships; of loss and love and the need for emotional and physical human interaction. 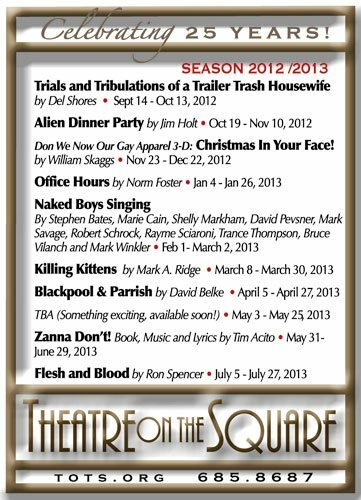 Note: The play contains strong adult content. Archer is a sweet, charming, attractive, gay man in his late thirties or early forties, who suffers from a borderline personality disorder. He is intelligent and a little on the reserved side. Although he does his best to suppress it, there is an air of sadness about him. Aileen is Archer’s best friend. She is boisterous, outgoing and speaks with a slight southern accent. Joshua Robinson (J.R.) is Archer’s uninhibited, good looking, upstairs neighbor. He is in his twenties and has an incredible body. Although he has been “Around the block,” he still manages to maintain a sweet, gentle disposition. Off Stage Voices Can be pre-recorded or double cast. Killing Kittens requires one unit set. The action takes place over the course of one evening, New Year's Eve, in the kitchen/living room of Archer's Chicago Apartment. SCENE ONE: Early Evening - around 6:30 p.m. SCENE TWO: Later, around 9 p.m. SCENE ONE: Even later, around 11:15 p.m. SCENE TWO: Early the next morning, around 4. a.m. 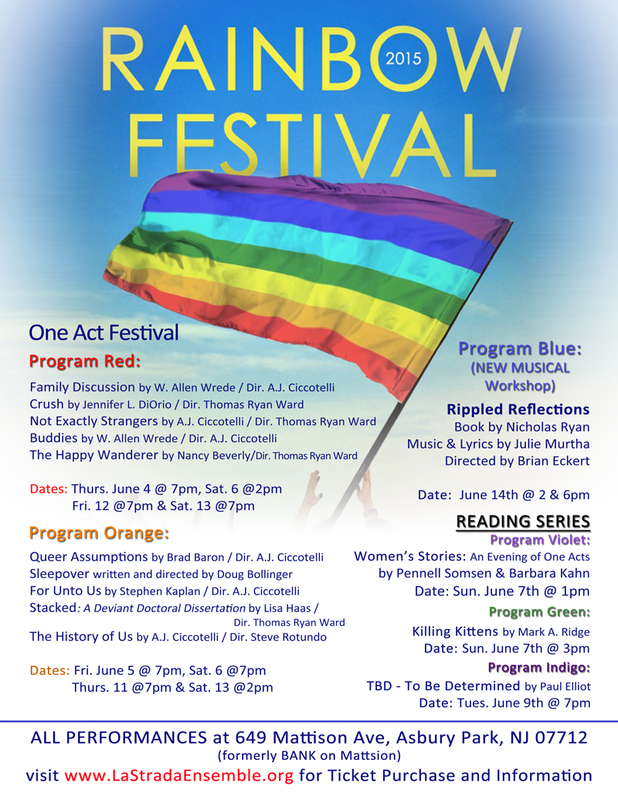 In 2015, Killing Kittens received a staged reading by the La Strada Ensemble Theatre in New Jersey. It was featured as part of The Pride Month Rainbow Reading Series. It was directed by artistic director, A.J. Ciccotelli.